You are looking at a picture of Liberty Cap. This rock formation at Yellowstone National Park in the western United States stands over thirty feet tall. It’s one of the many impressive natural features in the park. 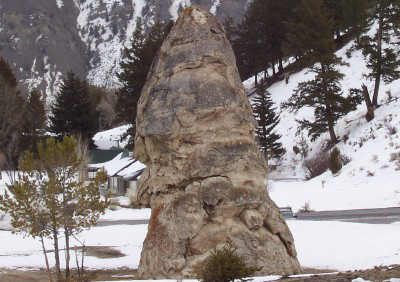 Just to keep you guessing, though, Liberty Cap isn’t a rock formation. It’s a spring of water. Water? That’s correct, or at least it was. Once, Liberty Cap wasn’t a huge stone chess piece. It was a stream of hot water springing from the earth. Doubtlessly, it sent a steaming flow down the mountainside. But as the water came to the surface and flowed away it left traces of minerals. Those minerals began to form a small rock. The rock grew--one foot, two feet, five feet, ten feet, twenty. And yet, the water flowed from its top and ran down its sides. The base of the fountain grew wider as it grew upward, almost like a mountain in the making. Then, something happened. Maybe the minerals began to plug the very channels the water flowed through. Maybe, the tower of rock grew so high that the pressure pushing the water upward was no longer strong enough to reach the top. Maybe something shifted under the earth and the water flowed elsewhere. In any event, the spring at Liberty Cap was quenched. The surrounding earth dried up. The spring became a dry rock. The Bible tells us that rivers of living water will flow out of the Christian. It is speaking symbolically, of course. Living water represents the Holy Spirit working in and through the child of God. Unlike the water that flowed from that Yellowstone spring, the "water" flowing from the Christian is pure. It will never choke itself off. There is no greater power to force it to flow elsewhere. Yet the Bible also warns against quenching the Spirit. We can supply the forces that will turn a spring of living water into a cold, hard rock. Frequent indulgence in sin, harboring a bad attitude, valuing the riches and pleasures of life more than we do God—all these will, with time, turn us from people through whom God works to sour, unhappy losers that do more harm than good. Allowing sin into our lives will turn us from sources of spiritual power and blessing, to the equivalent of hard, dry rocks.